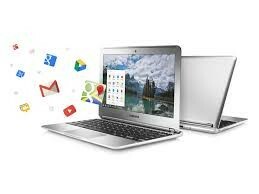 After careful consideration the decision was made to purchase 25 Chromebooks for VALTS students. Chromebooks resemble a traditional laptop, but there are some important differences. First, Chromebooks run on the Chrome operating system. Users can browse the Internet, use Google Apps, and download a variety of apps from the Chrome web store. Users can further enhance and customize their experience by adding extensions to their Chrome browser. We are very excited to see the wonderful things our students create with the new Chromebooks!